Fukushima Waraji Matsuri (Straw-sandals Festival) is a festival held every year with Shinobu Street in Fukushima-city, Fukushima Prefecture as the venue. The festival is a popular festival where a total of 250,000 people visit for two days. It is also one of the Tohoku Rokkon-sai Festival which started as a wish for the soul of the Tohoku earthquake and early recovery. Tohoku Rokkon-sai Festival also includes Akita Kanto Festival, Aomori Nebuta Festival, Sendai Tanabata Festival, Morioka Sansa-odori Festival and Yamagata Hanagasa Festival. 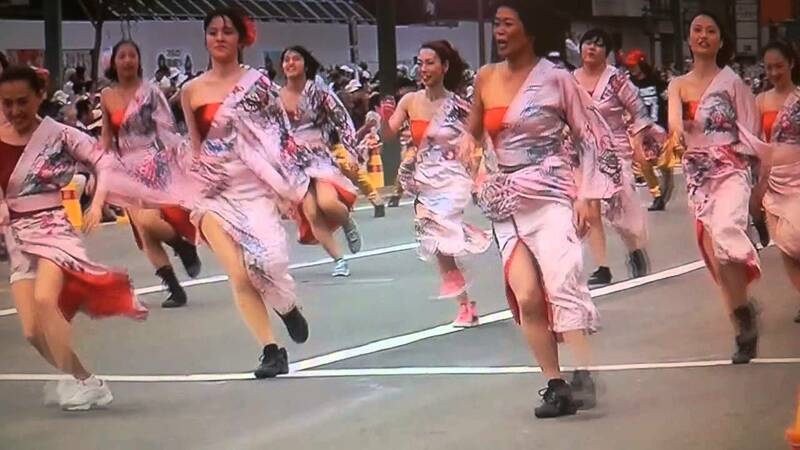 “Fukushima Waraji Matsuri” started with reference to “Shinobu-Sanzan-Akatsuki-Mairi” held every February. “Shinobu-Sanzan-Akatsuki-Mairi” is a festival with a long history of continuing from the Edo era. One of the great “Waraji” (straw-sandal) is dedicated at this festival and the other is dedicated at “Fukushima Waraji Matsuri”. It is reported that the origin of “Fukushima Waraji Matsuri” is the beginning of dedication of “waraji” to Haguro – jinja Shrine in Mt. Shinobu so that people going to the Ise Shrine can visit safely. “Waraji” (Straw-sandals) is the same size as the Nioh Statue who is in the shrine, it is a huge one that is 12 meters in length and 12 tons in weight. At the festival, this “gigantic waraji” will be dedicate by 70 people. 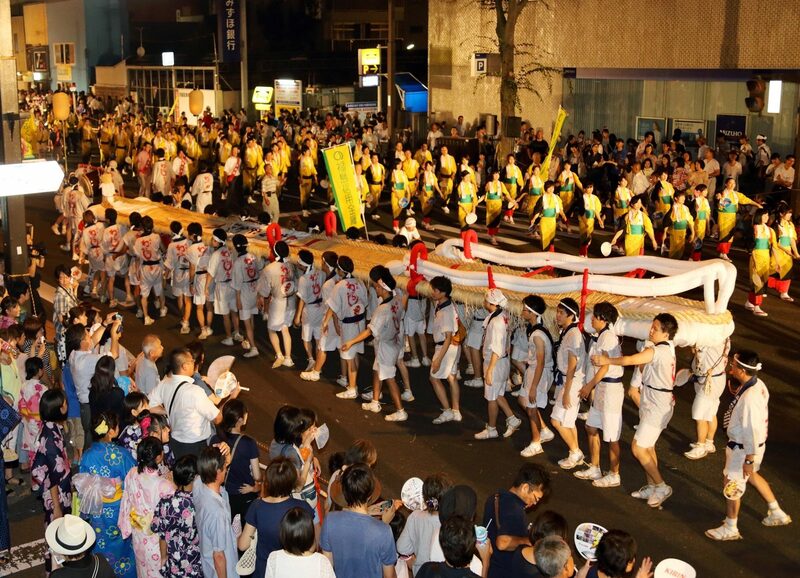 “Waraji Matsuri” is held in Shima City in Mie Prefecture etc. besides Fukushima Prefecture, but it is said that the one of “Fukushima Waraji Matsuri” is the largest in terms of the size of the waraji. “Fukushima Waraji Matsuri” sights are old fashioned Bon Festival style “Waraji Dance”, “Waraji Competition”, Hip Hop style “Dancing Soda Night” and so on. “Dancing Soda Night” is a fun event just watching that a total of 50 teams, over 3000 people will participate and show off the original choreography dance. Access to the venue is good from JR Fukushima station, so it is recommended to go by public transport. In Fukushima-shi, Fukushima Prefecture, the “Fukushima Waraji Matsuri” (Straw-sandals Festival) is held every two days in early August every year, and approximately 260,000 visitors come every year. 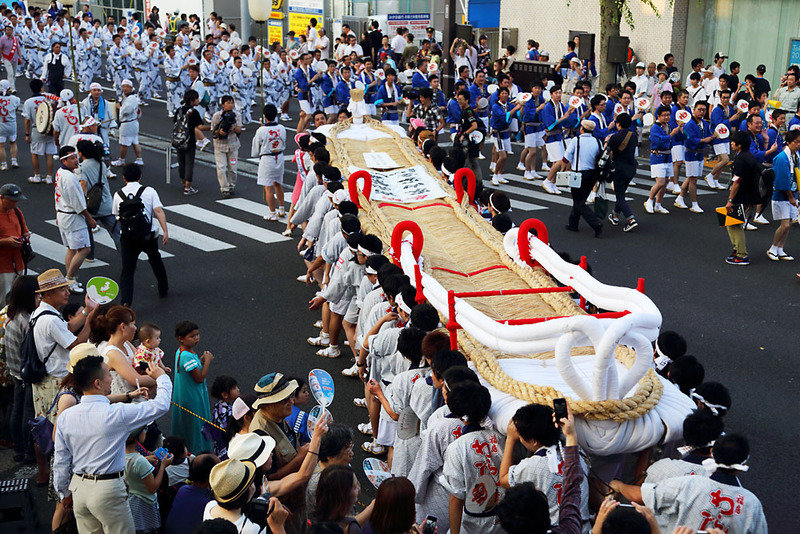 On the first day, the large Waraji with the length of 12 meters and the weight of 2 tons will be dedicated. 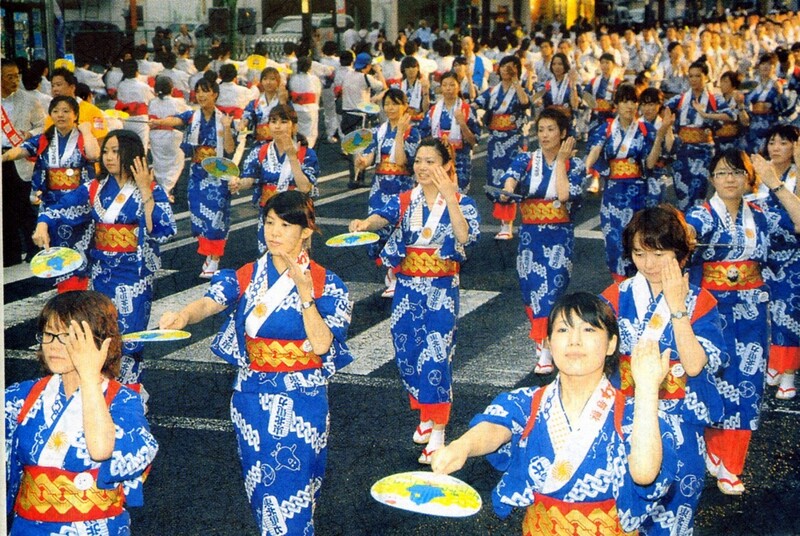 There are lively events such as “Waraji Dance”, “Dancing Soda Night”, “Waraji competition”. Fukushima Waraji Matsuri derives from “Akatsuki Mairi”. “Akatsuki Mairi” seems to have started dedicating the large straw-sandals that were made according to the size of the statue of Nio (two Deva kings) who was placed in “Shinobu Sanzan Haguro Jinja Shrine” in Fukushima City, Fukushima Prefecture. Therefore, it came to dedicate straw sandals to the healthy legs and safety prayers when people travel on long trips. This is the festival called “Akatsuki Mairi” held in February every year. 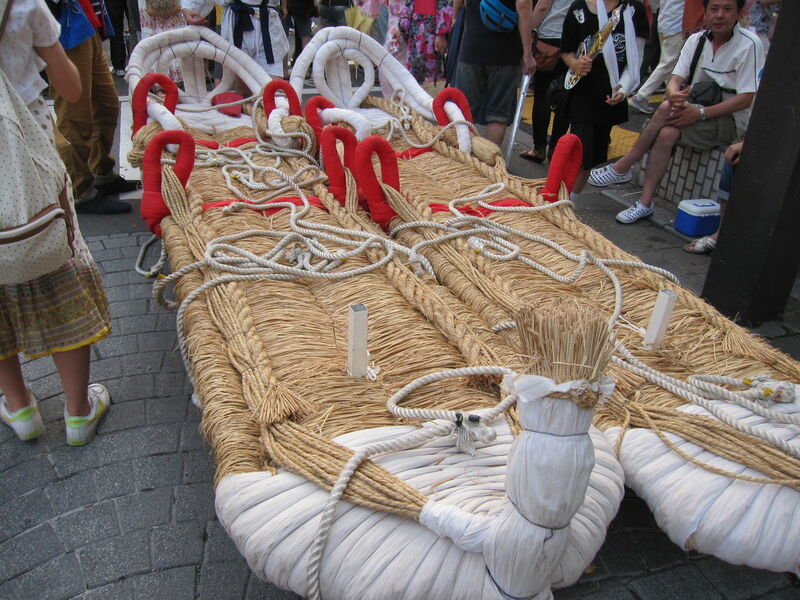 After that, based on the origin of Akatsuki Mairi, Fukushima City came to hold “Fukushima Waraji Matsuri” in August every year in order to have many people enjoy the Tohoku (Northeast area of Japan) Summer Festival, while keeping the tradition of the biggest straw-sandals in Japan. It began to hold. This festival is counted as one of the Tohoku 6 great festivals. On the first day, after dedicating the biggest straw-sandals in Japan to the venue, the women in a yukata-style, men in happi coat (a workman’s livery coat), dance gently according to “Heisei Waraji Ondo” (A Folk Song of Straw-sandals for a Dance). Continuously, “Dancing Soda Night” is held on the rhythm of hip-hop, various groups will show off a splendid dance with hot and various costumes.